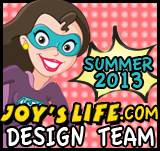 Thoughts of Scrapbooking: Skipping Stones New Release Blog Hop! 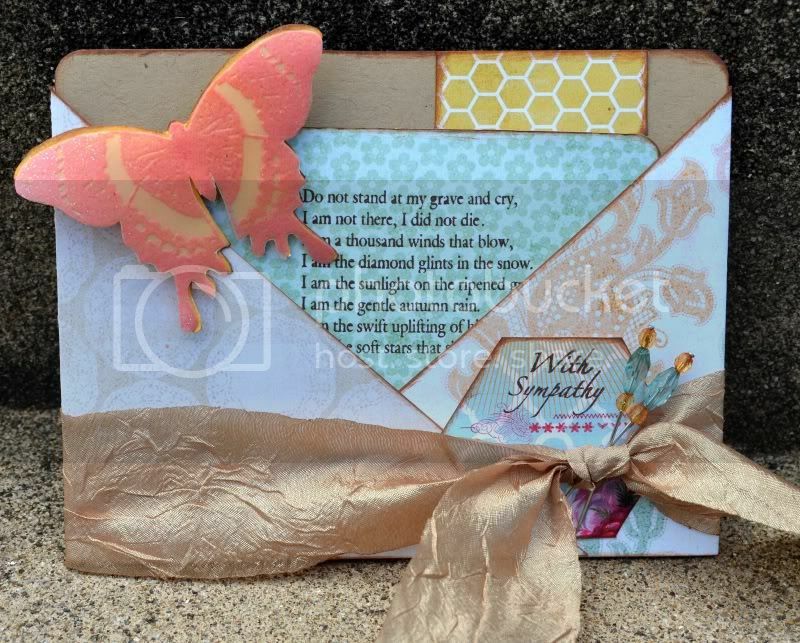 Welcome to the Skipping Stones Stamps New Release Blog Hop! I am so excited to be participating! You should have arrived here from Stephanie's blog, if not, you might want to head back to Wendy's and start at the beginning. 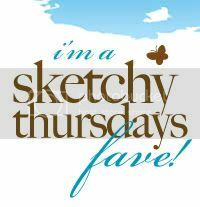 This is also this week's sketch challenge in which a random winner wins a set of stamps for participation, so check out the inspiration then head back to the skipping stones blog with your own creations. and now, look at this gorgeous new release! LOVING IT! Also, make sure you make it to the bottom of my post for a chance to win a special prize from me! I admit that this sketch scared me a little at first, but I am in love with how this card turned out! I used My Mind's Eye papers, Jillibean Soup pins, May Arts ribbon, Clearsnap inks and embossing powders and of course this gorgeous new release stamp set! 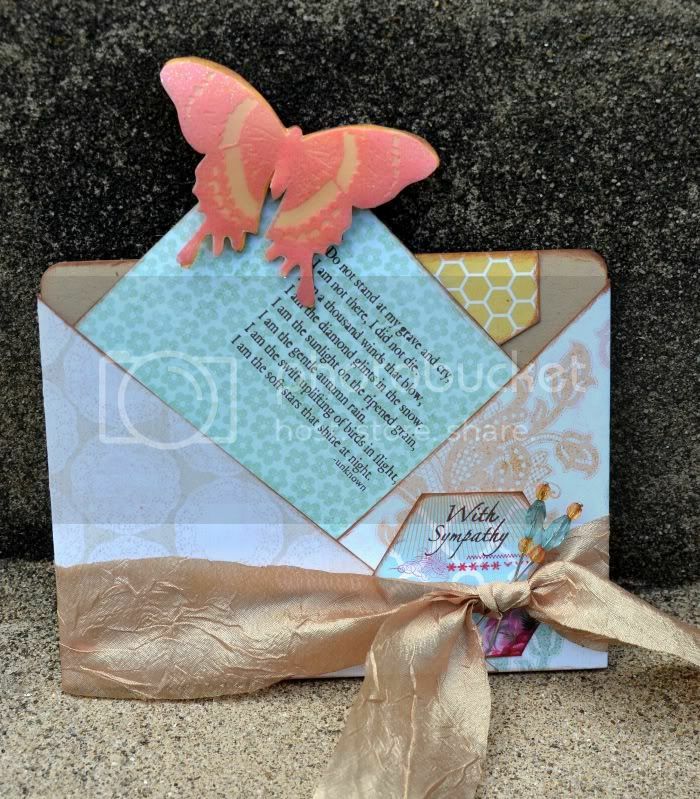 The butterfly and 'with sympathy' comes from the new release stamp set - Breathtaking Butterflies. The poem on the insert is from the Healing Wings stamp set. I made the insert removable so that is actually the 'inside' of the card. Here is a close-up of the butterfly stamp. 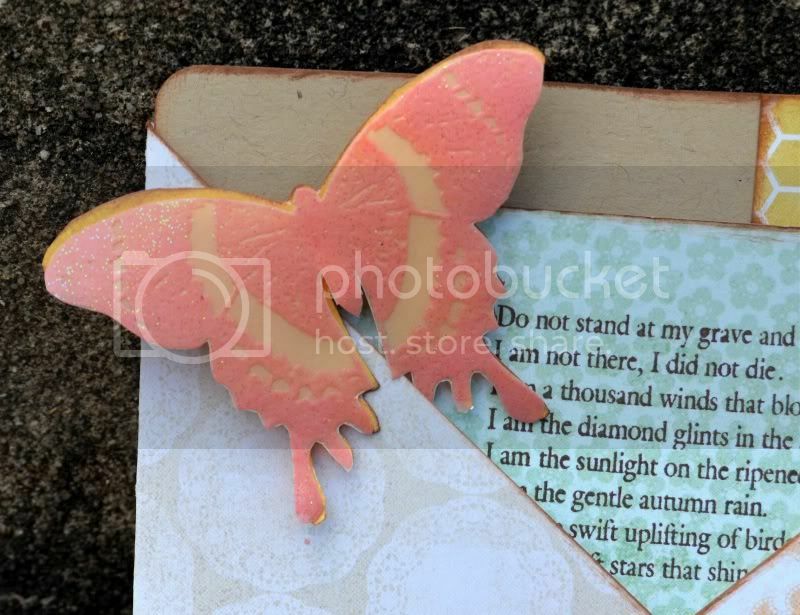 I stamped the solid butterfly in mustard ink on white cardstock, fussy cut it and inked the edges.Then I stamped the detailed butterfly on vellum in pink and embossed it with opalescent embossing powder before fussy cutting and adhering with foam tape for dimension. but make sure you become a follower and leave a comment below to be entered to win a prize from me! Today I am giving away a Smash book! You can win a smash book in your choice of black, orange, green or pink. All you have to do is be a follower (become one if you aren't already) and leave a comment. Megan, your card is just beautiful! I loved the way you combined several stamp sets! I'm glad you are joining us this month as a guest DT. You sure are inspiring many with these creations!!! 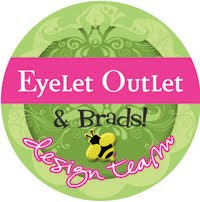 such a fun design...I love these new stamps...thanks for sharing.. These kinds of cards are so hard to make, but you did a really wonderful job here. Thanks for the chance to win too! Meg, this is so pretty! I love it! oooo! Love it! Sorry the sketch was tough ;) I love the papers and the quote in the pocket is just perfect!! your card is beautiful!!! great card, great design!!!! Great card! How funny....I JUST got done making the same kind of card! Beautiful card! Just became a follower! What a pretty sympathy card. like how you put the poem inside but peeking out. Thanks for the chance to win. Wonderful- definitely a great sympathy card! Beautiful creation, I especially like how you've incorporated the sentiment from another set. Gorgeous card! Love the colors and their simple elegance. Perfect for a sympathy card. Love the soft colours you used in your card. Very cool. I clipped your card because I like the fold-over idea. thanks for sharing! What a sweet, heartfelt way to send a sympathy message! This butterfly set really looks gorgeous! 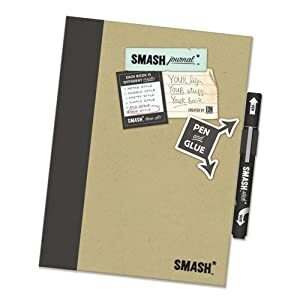 The Smashbook reminds me of my high school days! Cool! Great, Fabulous, Stunning Card Megan! I'm your newest Follower & would love to win that fab smash book. Thanks for the chance. Stopping by from Joy's page. Great blog! Out and about looking at random blogs. It does look like a difficult sketch, but you did a lovely card for a difficult occasion. Beautiful card, Megan! I love the way you made the quote removable. I am a new follower-so glad to have visited your blog! What a cute card!! I LOVE how the butterfly looks an embellishment!! gorgeous card!! I LOVE that card style!! This is so pretty! Thanks so much for sharing!